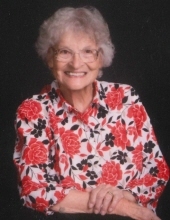 Naomi Elizabeth Tiner, 89 years young, went to be with Jesus on Sunday, March 17th at Golden Living Center in Shafter. Naomi was born to Elmer and Opal Snyder on May 4, 1929, in Gravette, Arkansas. She was the oldest sibling of two sisters, Mary and Clara, and one brother, Johnny. Her family moved to California in the early 1940’s. She graduated from Wasco High School in 1947 as valedictorian of her class. She married Charlie Tiner on March 14, 1948 at the Wasco Church of the Nazarene. Naomi made her career as a homemaker, mother and secretary at various Wasco businesses. Naomi was honored as Wasco Mother of the Year which was well deserved, as she was a loving mom to her two daughters and two sons, and later super mother-in-love to her children’s spouses. She was active in Mother Singer’s choir as well as a Cub Scout leader and camp counselor. She enjoyed crafting, cooking, gardening, and camping. She and Charlie enjoyed traveling the country – she was an expert navigator and photographer along the way. Naomi was a women of great faith in her Lord and was a member of Wasco Church of the Nazarene, and later, Westside Family Fellowship. Over the years she served as Sunday school teacher, choir director and song leader. She has left a legacy of a love for music which is evident in each generation that follows. Naomi is survived by her husband, Charlie Tiner of Shafter, CA; daughter, Evelyn “Evie” Hedman of Titusville, FL; son, Daryl Tiner of Wasco, CA; 12 grandchildren and 22 great grandchildren. She is predeceased by her daughter, Charlene Rickert and her Son Charles Wayne Tiner. The family is grateful to Shafter Golden Living Staff and Hoffman Hospice of Bakersfield for their excellent care. To send flowers or a remembrance gift to the family of Naomi Elizabeth Tiner, please visit our Tribute Store. "Email Address" would like to share the life celebration of Naomi Elizabeth Tiner. Click on the "link" to go to share a favorite memory or leave a condolence message for the family.